Maybe the author of the driver could name that attribute better. I'd love a way to rename this "Current Conditions". condition_icon is the attribute name for the condition icon value from the weather data. havent needed to try it before but dont believe attribute name with space is supported as in Current Condition or even condition icon. having an option to set a custom title for tiles would likely work better and be more flexible. Agreed. Although this particular driver is the only one I I've run into, I'm sure there will be others. Could I request a blind template please also need a blind driver but that's another request. Hi, do you know if custom title for tiles will be added in the future? not sure. i thought there were plans to add it. @patrick might be the best person to address this. For what it's worth I had similar needs in my housepanel app so I finally added a custom name feature. I now use it heavily and can't imagine life without it. Thank you - saved the day. Hi, I have an issue to update status o Dashboard, I made a test with 3 different devices. When I changed status to "Open" Dashboard show new status in 2-5 seconds, but when I change to "Close" only when click to open a page again I can see the new status. I’ve not been able to display the Attributes ‘units’, such as ‘W’ or ‘Watts’. Is there a trick to do this ? I’m using the built in Aeon Outlet driver with my Gen5 power plug. Is there a way to get a tile from an app (or URL app provides)? The use of device attributes for more sophisticated tiles (example weather) really destroys the event db as updating the tile happens so much that the event log fills up to 1000s of entries. This is a problem with the weather tiles folks are doing today - and it happens with most any data that changes a lot - attributes can't cover it. Or is there an app html end point / guidelines for including this into a dashboard? I'm still in the process of figuring things out but have a few dashboard suggestions. Icons: I believe it was mentioned Google's limited material icon selection is well limiting. Have you considered using Font Awesome? The free version has 1,480 icons and can be used for free in commercial projects. Given the split access, local dashboards could leverage a self-hosted version, and cloud dashboards could leverage one of the free CDNs (cdnjs.com or jsdelivr.com) for added performance. Cloud Links: This could just be my day job talking, but enabling cloud links by default seems like a security risk. The option to control links (local/cloud) or set a pin isn't available during the creation process. You've got to know to edit the dashboard to control them after the fact. I would propose including their control during dashboard creation or defaulting cloud links to off for added security up front. Local vs Cloud Pin: It would be nice to have per link (local/cloud) pins for dashboards. I use pins on my "cloud" dashboards for added security, but don't need them on "local" dashboards. Linked Pin: I've been taking the approach of one dashboard/room, with a main dashboard linking them all. If you have pins on each dashboard you must enter it each time you switch. It would be nice if links between dashboards wouldn't prompt for the pin unless different from the last dashboard. Customize Tiles: As others have likely already requested it would be nice to customize dashboards beyond a background image. Even just the ability to load my own CSS would be an improvement. It's easy enough to override default styling. Dashboard Editing: The dashboard menu is functional, however after spending some time in the SharpTools interface it would be nice to see a few refinements. a) Consider breaking out the "global" controls similar to template colors - Grid Size, Background Color/Image, Font Size. I end up changing these values by mistake. Sure, it's nice to have them handy, but do people really edit them that frequently? b) Consider placing "Tile Options" first followed by size and lastly position controls. It would be nice if you could "preview" a tile, to get the right device, switch templates, position, size, and then add it last. I find my self creating test dashboards just so I can create a mass of tiles for the same device just switching the template. This is likely just me being new to the concept of dashboards (coming from Wink). c) Consider adding the local and cloud links to the dashboard menu. I typically want the link when viewing the dashboard, not editing it. I look forward to seeing the evolution of dashboards. 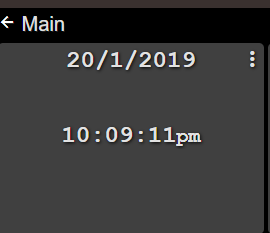 Is there a way to change the format of the date when using the clock-date format? I would like to use the mm/dd/yyyy format instead of the dd/mm/yyyy format if possible but not seeing an option to change it. Right now, if memory serves, the date format is currently tied to enabling 24 hour in the dashboard child advanced settings. It is correctly showing 12 hour time but showing the wrong format for the date. Reload your dashboard, toggling that option requires a refresh of the dashboard.